In the 16th century, prior to the arrival of Europeans, a village was founded on this site by the Huron-Wendat, a Nation of agriculturalists and fisher-hunter-gatherers. In response to increased conflict in the region, many smaller villages merged to form a three-hectare settlement of 1,700 people, with more than 50 longhouses arranged around a central plaza, surrounded by a palisade, a ditch and an embankment as protection. The economic and political functions of the Huron-Wendat Nation were highly sophisticated, integrated and coordinated. Artifacts from the site, which include a fragment of a Basque iron tool, demonstrate that the Huron-Wendat formed alliances and traded goods with other First Nations in complex networks that extended across the continent. The community later moved north to join the Huron-Wendat Confederacy in the lands south of Georgian Bay. The village was identified by archeologists in 2002 and excavated between 2003 and 2005. 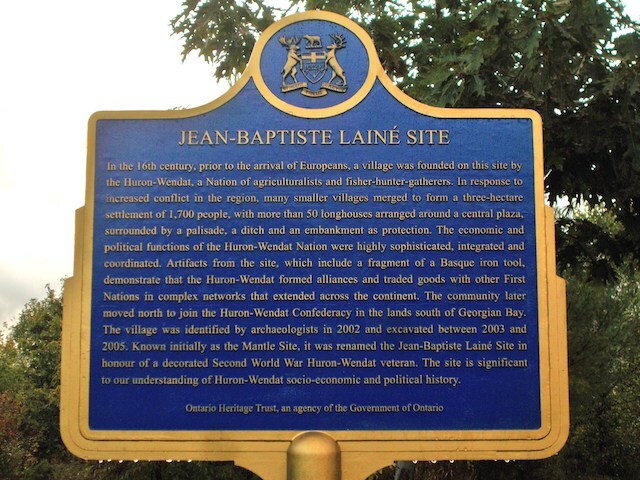 Known initially as the Mantle Site, it was renamed the Jean-Baptiste Lainé Site in honour of a decorated Second World War Huron-Wendat veteran. The site is significant to our understanding of Huron-Wendat socio-economic and political history.